Plants forming large clumps, with rhizomes 3-5 mm thick. Basal rosettes well-differentiated; sheaths pubescent; blades ovate to lanceolate. Culms 50-140 cm, stout, pilose with papillose-based hairs to subglabrous; fall phase branching from the mid- and upper culm nodes, with a few, nearly erect, elongate branches, sparsely rebranching, sheaths overlapping, concealing the secondary panicles; nodes not swollen, glabrous or sparsely pubescent. Cauline leaves 5-10; sheaths not overlapping, striate-ribbed, narrowing above midlength, hispid to sparsely hirsute, hairs sometimes papillose-based, summits mottled with pale spots, margins ciliate, collars puberulent; ligules 0.4-0.9 mm, membranous; blades 10-25 cm long, 15-30 mm wide, flat, lanceolate, often rigid, glabrous or sparsely pubescent, with 9-13 major veins and 40-80 minor veins, bases cordate, with papillose-based cilia, apices acuminate. Primary panicles 8-16 cm long, 4-12 mm wide, exserted, with many spikelets. Spikelets 2.4-3.6 mm long, 1.2-1.5 mm wide, narrowly ellipsoid, sparsely pubescent. Lower glumes 1/3-1/2 as long as the spikelets, narrowly triangular; upper glumes and lower florets slightly shorter than the spikelets, with 7 or 9 prominent veins; lower florets sterile; upper florets umbonate, apices with a minute tuft of hairs. 2n = 36. Dichanthelium clandestinum usually grows in semi-open areas in damp or sandy woodlands, thickets, or on banks. It is restricted to the eastern part of the Flora region. The primary panicles are open-pollinated for a brief period, and produced from late May to early July; the secondary panicles, which are cleistogamous and usually concealed within the sheaths, are produced from July through September. Panicum recognitum Fernald refers to rare sterile hybrids with Dichanthelium dichotomum and perhaps D. scoparium; Panicum aculeatum Hitchc. & Chase to putative sterile hybrids with D. scabriusculum or D. dichotomum. Perennial herb, with 3 - 5 mm thick rhizomes, forming large clumps 0.5 - 1.4 m tall Inflorescence: a terminal, branched arrangement of spikelets (panicle). Primary panicles atop the culms, 8 - 16 cm long, 4 - 12 mm wide, exserted, with many spikelets. Secondary panicles (when present) atop the branches. Fruit: a caryopsis, indehiscent, enclosed within the persistent lemma and palea. Culm: stout, 0.5 - 1.4 m long, round in cross-section, hollow, nearly hairless to softly hairy with bumpy-based hairs. Nodes sometimes sparsely hairy. Fall phase branching from the mid- and upper culm nodes, sparsely rebranching, with overlapping sheaths and concealed secondary panicles. Spikelets: 2.5 - 3.5 mm long, 1 - 1.5 mm wide, narrowly ellipsoid, pointed, prominently veined, sparsely hairy. Basal leaves: in a rosette. Sheaths hairy. Blades shortly egg-shaped to lance-shaped, distinct from stem blades. Stem leaves: five to ten, alternate, two-ranked. Sheaths not overlapping, usually shorter than internodes, tapering above mid-length, ribbed, pale-spotted and mottled at the apex, hairy (sometimes with bumpy-based hairs), fringed with hairs. Ligules 0.5 - 1 mm long, membranous. Blades rigid, distinctly longer and narrower than basal leaves, 10 - 25 cm long, 1.5 - 3 cm wide, lance-shaped with a heart-shaped base and pointed tip, flat, many-veined, sometimes sparsely hairy, fringed with bumpy-based hairs basally. 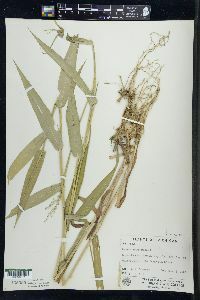 Glumes:: Lower glumes one-third to one-half as long as spikelets, narrowly triangular, veined. Upper glumes a bit shorter than spikelets, rounded to pointed at the apex, with seven to nine prominent veins. Lemmas:: Lower lemmas similar to upper glumes. Upper lemmas longitudinally lined, shiny, with rolled-up margins above. Paleas:: Lower paleas shorter than lower lemmas, thin. Upper paleas longitudinally lined. Florets:: Lower florets sterile, a bit shorter than spikelets, with seven to nine prominent veins. Upper florets bisexual, stalkless, minutely tufted at the apex, plump. Anthers three. Stigmas red. Habitat and ecology: Common in sandy and somewhat acid soils in moist shaded ground. It also occurs in drier sandy soils. Often found in sandy areas along streams. A hybrid with Dichanthelium depauperatum was found in LaPorte County, Indiana. Etymology: Dichanthelium comes from the Greek words di, meaning twice, and anth, meaning flowering, referring to plants that may have two flowering periods. Clandestinum means hidden. This species is infrequent to rare in the northern part of the state; rare, local, or absent in the central counties; and frequent in most of the southern half of the state. It prefers low ground and is more abundant in areas where the soil is slightly acid. It is generally found on the moist slopes of streams and ditches. 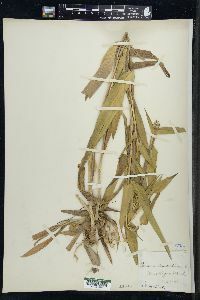 It usually forms large colonies, and often specimens with exserted panicles are absent, especially in the autumnal phase.